Ohsweken, Ontario – December 17, 2012 – Glenn Styres and the staff at Ohsweken Speedway would like to express their gratitude and well wishes to Ken and Cheryl Pelkie, who recently retired from their positions at the track. 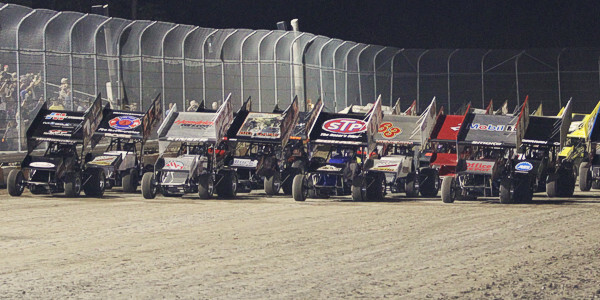 The Pelkies played integral roles in the growth and prosperity of the speedway, especially its signature event, the Canadian Sprint Car Nationals. From advance ticket sales to on-track procedures – and everything in between – Ken, Cheryl, and many of their family members had a hand in many different aspects of business at the speedway. The dream of weekly Sprint Car racing in Southern Ontario become a reality under the guidance of the Pelkies. Car counts in all four of Ohsweken’s Friday Night Thunder divisions grew steadily with the help of Ken and Cheryl during their time at the track, including a banner year in 2012 when over 100 entries were common each week. “It’s going to take ten of us to replace them,” stated speedway co-owner Glenn Styres. Schedules and other plans for the 2013 season are well underway, and an announcement regarding a new Ohsweken Speedway management team will be made in the coming days. The World of Outlaws Sprint Car series will return to Ohsweken in 2013, with the date of Tuesday, July 30 already confirmed. Tony Stewart has claimed the feature win in each of the last two World of Outlaws Sprint Car series events at Ohsweken, including his first career win with the series in 2011. About Ohsweken Speedway: Ohsweken Speedway is a 3/8 (0.375) mile clay oval owned by the Styres family, and located in the village of Ohsweken, Ontario, Canada. Ohsweken’s weekly Friday Night Thunder program runs from May to September, featuring Corr/Pak Merchandising Sprint Cars, Lighthouse Tattoos Thunder Stocks, HRW Automotive Mini Stocks, and Pierced Parts Bombers, while the season finishes each year with the annual Canadian Sprint Car Nationals. Ohsweken Speedway has also been a yearly stop on the World of Outlaws Sprint Car series schedule since 2007.